I recently showed off model rockets for some neighbor kids this week, and I built one of these to show off some almost free rockets that you can blast off. I tested it indoors (big mistake) then had to work to clean the smudge off the ceiling. These are more powerful and fast than you'd expect. Out doors it disappeared (almost) higher than the trees. After two launches it was lost in the trees. No matter - a little paper and tape and I've got two more ready for flight. 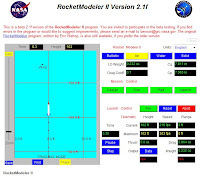 Googling around and I found a terrific rocket simulator/design tool at NASA! This amazing thing does simple ballistic, water, and solid engine rockets. Even better - it does AIR ROCKETS! (pictured). Clicking on the links, it turns out there is some pretty sophisticated information and math for rocket scientists. Here's a family gathering launching Air Rockets! Fun!